In Sentle you are able to edit single or group emails by either using the check box per email (single) or selecting the check box at the top of the email list (bulk edit) as shown below. Mark as Read: Will change the colour of an email from blue to white to indicate that it has been read. Mark as Unread: Will change the colour of an email back to the original ‘unread’ state. Delete Selected Emails: Will deleted the emails you have selected. Clear Email State: Will remove the previously chosen email state from the selected email. Located in the top right of the email list window is a ‘Filter By’ drop down menu that allows you to only view emails based on the selections available. 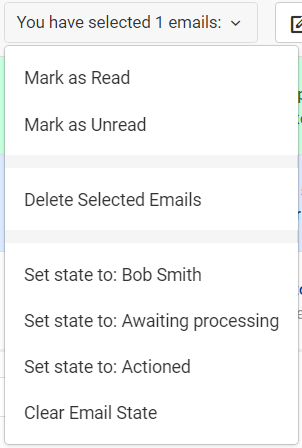 Filter by state/action: These selections (as shown here as the top three) will filter the email inbox to only show emails that have been tagged with the relevant state. 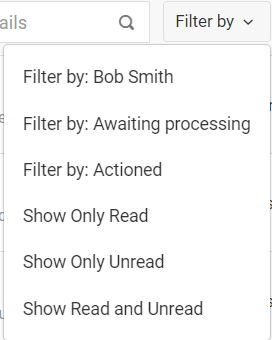 Show Only Read: Will display emails marked as read. Show Only Unread: Will only display emails that haven’t been marked as read. Show Read and Unread: Will display emails of both types.